Believe it or not, this imposing sculpture is made out of a material that we usually associate with teacups and figurines for our end tables. That’s right–this two-and-a-half feet tall man is made out of porcelain! But it’s not just any porcelain. It’s porcelain made at the factory in Meissen, Germany. You may remember Meissen as one of the most important names in European porcelain production from my series on German drinking vessels. Just to recap, Augustus the Strong, Elector of Saxony and King of Poland, was obsessed with porcelain and purchased huge amounts of Chinese and Japanese examples for his palaces in Dresden. But he, like so many rulers in Europe, wanted to be able to make what was dubbed as “white gold” for himself. Augustus took over the rule of Saxony in 1694 and promptly put a number of scientists to work on the problem. Kaolin, the special clay needed to make hard-paste porcelain, was finally discovered in Saxony. In 1709, J.F. Böttger, who originally was brought to the court as an alchemist (because gold gold was just as desirable as white gold), discovered the mixture required to make porcelain. In 1710, Augustus established the royal factory in Meissen (near Dresden). By 1713, the workers at Meissen were producing porcelain for his collection. Augustus tried to keep the process secret, because not only did it raise his prestige among the rulers of Europe, but it also meant that he could sell works to other nobles and make some money from it. Meissen held a near monopoly on porcelain production in Europe for almost 40 years, although workers took the secrets to Vienna to found a factory in 1719. Then, in 1747, a worker defected from Vienna and spread the knowledge throughout Germany. So, what’s the story behind this large-scale figures totally different from the tableware we’ve shown on the blog before? The best known large-scale Meissen sculptures depict animals, such as this lioness at the Metropolitan Museum of Art or this vulture at the Art Institute of Chicago. This is because around 1728 Augustus the Strong decided to mimic a live menagerie—many European nobles had one full of exotic animals that were gifts from foreign lands—in porcelain. The talent of the craftsmen at the Meissen factory is astounding. Within just a couple of decades of figuring out how to make porcelain, they were able to make these huge porcelain objects. It required just the right mix of materials and a careful technique to make sure that the sculptures were not destroyed at some point in the process. Even those that passed quality inspection would have cracks appear during the firing process—filled in later with plaster to disguise them—and they were left all white because the temperature changes required for firing colors were too difficult to add to the variables. Paint was added after the firing over the glaze. If you look carefully at our figure, you can see the firing cracks in the base and the lower part of his coat. 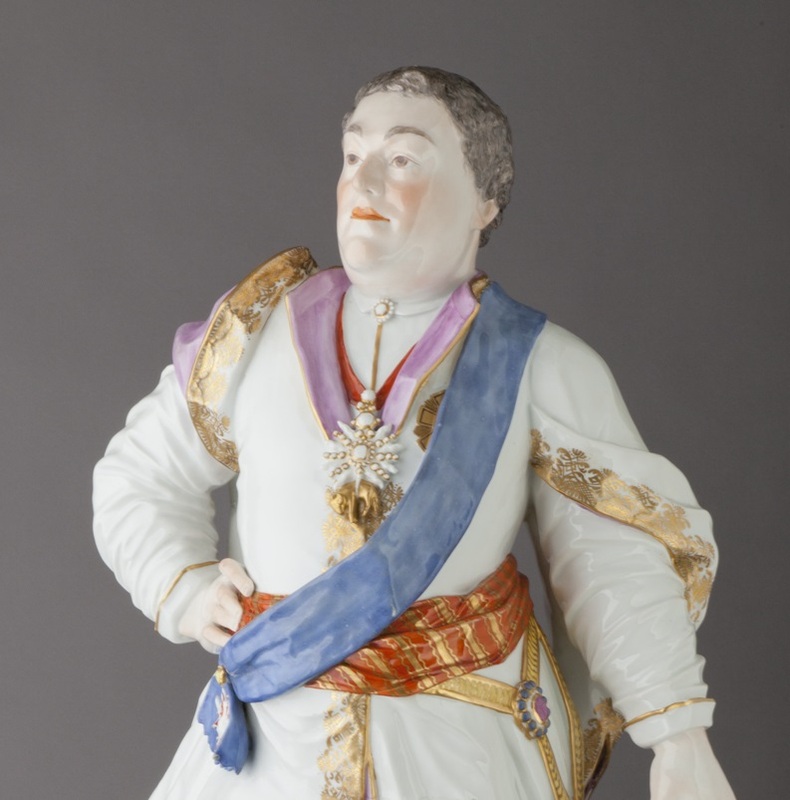 So who is depicted in our important and rare example of Meissen porcelain? He is Augustus III, the only legitimate son and successor of Augustus the Strong, the driving force behind the Meissen porcelain manufactory. Upon his father’s death in 1733, Augustus III took his father’s titles. The identification derives from a well-documented painting by the court painter Louis de Silvestre in the Gemaldegalerie in Dresden. As King of Poland, Augustus III is wearing Polish costume: he stands confidently in a dramatic greatcoat with a sash across his chest and holding a fur hat. He wears the Order of the Golden Fleece around his neck. This order was a knighthood formed in the 15th century and by the 18th century was a de factor honor given by the Roman Catholic Church to the highest members of the nobility. Only three other examples of this sculpture of Augustus III are known to exist. Two of them are white without paint. One sold at Christie’s on October 21, 2004, the other is owned by the Staaliche Kunstsammlungen in Dresden. A painted one is in the collection of the Museum of Fine Arts, Boston. Since large-scale porcelain was a trademark of 18th century Meissen, it is a very desirable for collectors. And, of course, it is also very rare. Because the large-scale figures of Augustus III are so unusual, the date for individual pieces is difficult to state. So much of 18th century Meissen has been reproduced over time and experts ten to assume that the porcelain is later unless there is a very good reason. Upon the recommendation of an outside researcher in Germany, we date our sculpture to the 18th century, but we continue to conduct research. 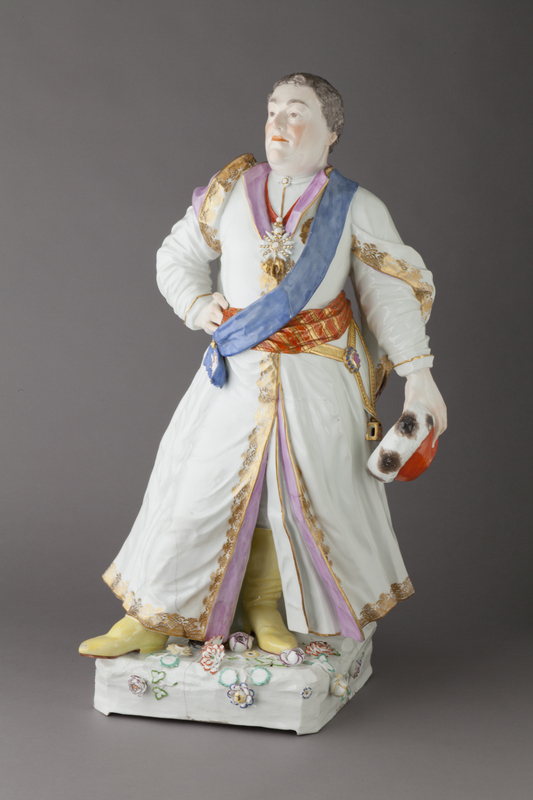 No matter what the date, our Meissen figure of Augustus III will certainly command attention when he is out in the galleries. As patron of the great Meissen porcelain factory, he will be a fantastic focal point for an installation of Meissen porcelain! This entry was posted in Art, Curatorial and tagged augustus iii, European art, meissen, porcelain. Bookmark the permalink.